Eric just got most of his crisis suits in last week, so we were eager to play a game with his new army. He was able to add two more broadsides, four crisis suits, and another hammerhead to his list. I just dropped some upgrades and ran an extra wave serpent. Unfortunately, the game was a pretty clean sweep. The mission was annihilation and the deployment was dawn of war. I didn't realize how badly dawn of war might be for tau until I realized how quickly my seer council could get to him when I could deploy it in mid-field. I started everything at the center of my table edge except for the seer council, which I deployed on the far right and as close to his table edge as possible. I used the first turn to turbo boost my council and wave serpents as close to his forces as I could. 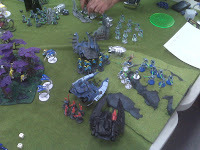 As usual, forcing Tau into assaults went quite well for the Eldar. 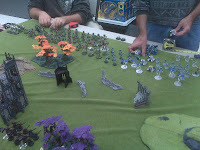 My deployment... note the partially painted Realm of Battle board. One of these days I'll get around to finishing it. The seer council swings around the edge of the table to hit from the right flank. I managed to take out both hammerheads on turn two and tie up the broadsides in close combat by turn three. At that point, Eric conceded. He realized that I still had five tanks on the board and I had taken out all of his anti-tank squads except for a few S6 or S7 guns on a some of the crisis suits. When all three broadsides missed my wave serpents on the first turn and then only managed a shaken result on the second turn, things went south quickly for him. The next time we play, he'll be running a squad of vespids and two more crisis suits (all nine next time). I, on the other hand, will just be adding upgrades to catch up. I've got a feeling my luck will change soon. I went to Southern Pines this weekend and was dismayed to find that the hobby shop I used to frequent was no longer there. It is always a shame to see great hobby shops go out of business, and I feared that the slowing economy had forced John to close up shop. After a quick Google search, I breathed a sigh of relief. Apparently, they're still around... they just moved. The next time I make it to Southern Pines, I'll be sure to stop by. I was never really a regular, and it has been three years now, so I doubt anyone will even remember me. Back then, I was a fiercely competitive Magic: The Gathering player, I managed to get in one or two games of D&D per year, and I was still scoffing at Warhammer because it was too expensive to get into. Nowadays, my gaming interests have made a huge shift: Warhammer 40K at least once a week, D&D as often as weekly but usually more like monthly, and I can probably count on one hand how many games of Magic I've played in the last six months. Even if I started going regularly (which I wouldn't, because now it's three hours away), I'd probably be running with a completely different crowd. But alas, I do have some good memories there. Hit Point Hobbies does have a much better website now, with lots of pics and an online store. I would encourage anyone in or around Southern Pines to check them out. There are always good folks running all kinds of games there: RPGs, CCGs, wargames, and probably other stuff that even I don't play... take your pick. Well, my seer council has performed much better since I changed its configuration. It has only had the opportunity to assault twice in the last two games, but this has had much more to do with the deadliness of multiple destructor templates than a failure to get within range. Apparently, fire warriors in cover have a tough time dealing with AP 4 templates. Looking toward the future, I'm going to need to upgrade to a 1500+ list soon. My brother is getting six crisis suits as an early Christmas present, so he will more than catch up with me. I'm not sure how high he'll want to go, but I'm going to aim for 1500 for the moment and I'll add on an upgrade or two if he wants to go higher. This list is still in the works, but it's what I'll probably be running unless I have a major strategic breakthrough between now and next week. 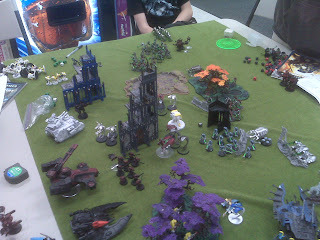 Eric and I headed down to Hobbytown USA of Hickory last weekend for our first taste of playing Warhammer 40K outside of the family... and it was an interesting experience. We got a game going pretty quickly... my Eldar and my brother's Tau were allied with the space marines of a kid whose name I can't remember. We each had 1500 points. It didn't take long to tell that we were pretty much doomed. Tau need to keep decent range. 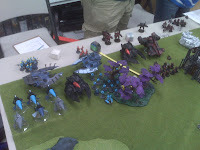 Eldar need room to maneuver. With the board so packed full of infantry, neither of us had any room to play to our strengths. I was running two fire prisms, so I was hoping to even the odds a bit by clearing some room with large blasts. Unfortunately, before I got the chance to shoot, one went down to opposing fire. The other didn't manage to kill as many troops as I'd hoped. 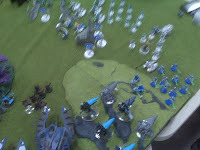 I ran my seer council out front to throw some templates into the infantry and tie up some guys in close combat. Unfortunately, they ran up against a unit of guys that could ignore invulnerable saves. Needless to say, my council didn't last long. We actually ended the game early because the store was closing, but it was quite clear who won. We got completely overrun by necrons. I've learned my lesson... if the numbers go too high, politely decline to play. I'm all for playing big games, but huge point totals need huge playing surfaces. My bikes and skimmers need to fly around the board a bit, and an eight inch deep wave of infantry that stretches across the whole length of the table and advances each turn isn't really a fair fight for me. That many troops on such a small table just gave assault-oriented troops too much of an advantage... in the same way that deploying on the short table ends with no terrain in between would have given us an unfair advantage. So far, this is the only loss I've experienced with my Eldar, and I'm going to count it as such. I guess I should have known better than to accept the game. We haven't played D&D in a while, but we got the opportunity again this week when Matt took the DMing seat. His first DMing experience with more than one player ended with an interesting twist of fate... but I'll get to that in a bit. We began with a simple mission: travel to Winterhaven, see if a death cult exists there, and kick some tail if you find it. On the way, we were ambushed by a pack of kobolds. Kobolds! Ha! Easy XP! Right? We fought a good fight, but ultimately fell to a pair of little buggers that we just couldn't seem to put down. One was even bloodied already. We were... so... close... but failed. What kind of pathetic moron players lose to kobolds in the first encounter of the adventure, anyway? Apparently, Eric and me. While we were casually making fun of ourselves for getting beaten by kobolds, Matt seemed to be suffering from a mixture of shock and disappointment. "I ran it straight out of the book," he commented, referring to the Keep on the Shadowfell adventure. That's when the lightbulb went on in my head. Whoah... we almost won a fight that was intended for five PCs. Perhaps we weren't as pathetic as we thought. Once I explained to Matt what had happened, he used a healthy dose of deus ex machina to put the adventure back on track. Dead? Of course not! We were rescued by a good Samaritan and dropped off at the tavern in Winterhaven. By the end of the session, we still hadn't found the death cult, but we did manage to secure a contract to kill some kobolds. Revenge is coming next session... oh yes, revenge is on its way.